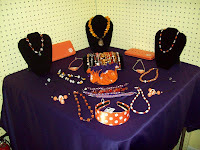 Clemson Girl: Complete your Clemson gameday outfit with jewelry from The Beaded Tiger – get 15% off! 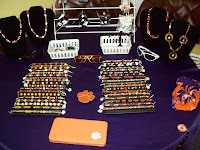 Complete your Clemson gameday outfit with jewelry from The Beaded Tiger – get 15% off! Let’s face it… your gameday outfit is not complete without the final touches – the accessories – jewelry, handbags, headbands, sunglasses, etc. And finding the perfect accessories for your outfit is probably the most fun part of putting your gameday outfit all together. Well, you can get all of your accessories to complete your outfit (gameday or not) at The Beaded Tiger, a jewelry and accessories shop in Clemson (click here for a map). 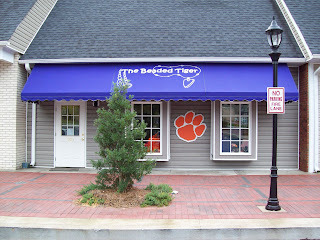 The Beaded Tiger sells a ton of Clemson jewelry, handbags and accessories. The store has been doing business in the Clemson community for seven years, and owner Jodi Oliver has worked at The Beaded Tiger the entire time – serving as the owner for the past five years. Jodi, who’s also currently a student at Clemson, says the goal of The Beaded Tiger is to provide a place for people to find the exact jewelry they are looking for. If you can’t find what you’re looking for out of The Beaded Tiger’s large selection of premade jewelry, The Beaded Tiger carries all the supplies, beads and tools you need to make your own, custom gameday jewelry. Don’t worry – if you don’t know how to bead and make jewelry, the staff at The Beaded Tiger will help you create exactly what you need. If you’d like to learn how to make your own gameday jewelry, you can also take beading classes offered by The Beaded Tiger. Check out some of the photos below of the great selection at The Beaded Tiger…Click on the images to see a larger view. 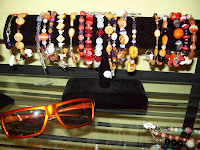 Look at these awesome bracelets and necklaces below – and I’m digging those orange sunglasses, cute! The great thing about The Beaded Tiger is you can create something totally unique for your gameday jewelry – so no one else will have the same jewelry as you. Hello handbags… perfect for gamedays to hold EVERYTHING – plenty of room for the poncho for the rain that has been haunting the home games this year. 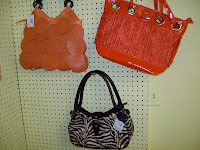  How cute is the tiger striped purse in the second picture? Love it. Watches!! I LOVE my orange watch that I wear every Clemson homegame – and it wasn’t easy to find. 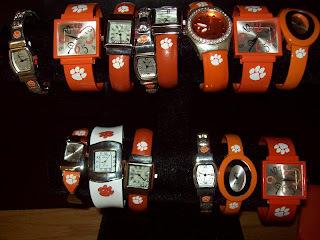 Look at this selection of Clemson watches at The Beaded Tiger! I love the orange one, second from the right on the top row with the fun squiggle letters! 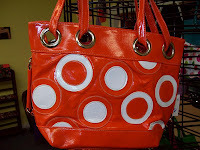 So make a point to stop by The Beaded Tiger and stock up on some awesome gameday jewelry, handbags, and accessories. These would make great Christmas gifts – it’s never too early to start your shopping! Guess what? 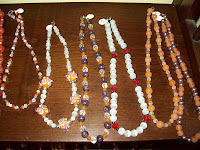 Mention you read about The Beaded Tiger on ClemsonGirl.com and get 15% off of your purchase! You can also find The Beaded Tiger downtown this weekend on Homecoming – they have a booth set up on the downtown-side of TD’s, facing Mr. Knickerbockers. You can shop all of The Beaded Tiger’s awesome gameday selection at their booth Saturday from 8 a.m. to 1:30 p.m. and after the game is over. You can still get the 15% discount if you mention you found them on ClemsonGirl.com – but, be the very first person to their booth on Saturday, mention you found them on ClemsonGirl.com, and get a FREE pair of earrings!! The Beaded Tiger is open Tuesdays – Saturday (closed on home gamedays, but you can find them at their booth downtown) from 10 a.m. to 6 p.m. If you have any questions you can contact them at 864-624-9240. I got the big orange watch with the crazy numbers, it's great! And, since I was the first one there and mention Clemson girl, I got me a free pair of the cutest earrings!!! Go TIGERS, and go Clemsongirl.